The Game Of Numbers – Why Finance At XLRI? The two-year full-time program in Business Management (PGDM) at XLRI offers a number of finance courses in the first year to ensure that students from varying backgrounds, especially those not from the finance domain, gain a conceptual and analytical understanding of finance. With the use of theory, cases and individual/group projects, the curriculum ensures that the students are able to integrate and apply theoretical concepts to real-world problems. First-year courses such as Management Accounting, Corporate Finance, Cost Accounting etc impart essential financial knowledge ensuring all students have a good understanding of the basics of finance, that are essential to all future managers. Students can specialise in the finance domain in the second year by choosing from a vast pool of finance electives such as Business Analysis and Valuation, Financial Analysis, Planning & Control, Financial Modelling using Excel, Risk Management etc, along with niche courses such as Structured Finance, Fixed Income Securities to gain a holistic understanding of the domain. The student-run committee FINAX – The Finance Association at XLRI, strives to promote finance related activities and careers for all students on campus. The committee conducts various events on campus and nationally to keep students and faculty updated about the current on-goings in the field of finance. Some of the activities conducted every year are Budget on Campus, Dealbook – A national Mergers & Acquisition case competition, workshops, seminars and competitions on various contemporary topics. In the year 2018, accomplished speakers have conducted workshops in the Fintech domain, Real Estate Investment (REITs) and Credit Risk. Notably, the Deputy Governor of the RBI, Shri N.S. Vishwanathan conducted an interactive and informative session on “Banking and Supervision – Policy, Concerns, and Expectations”. 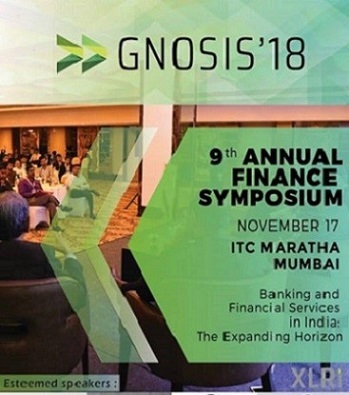 FINAX also conducts their flagship event, Gnosis, the annual finance symposium, every year in Mumbai. The symposium was started in 2010 as an endeavour to build a platform for industry leaders in the domain of finance to come forward and discuss relevant issues and challenges related to the industry. The conference has garnered interest and support from industry experts and thought leaders over the years as XLRI continues to promote such industry interaction platforms. The core objective of the symposium has been to leverage the wealth of knowledge of speakers and participants. Some of the notable speakers include Dr Rajiv Lall, Founder, MD & CEO, IDFC Bank, Ms Anshula Kant, MD, SBI, Mr Samit Ghosh, MD & CEO, Ujjivan Small Finance Bank, Mr Bunty Bohra, CEO, Goldman Sachs etc. The XLRI Student Fund, an initiative of FINAX, is XLRI’s in-house equity fund which gives students the experience of managing an investment portfolio. It was conceptualized with the objective of providing future managers with a launch pad to hone their investment skills through the experience of managing a real investment portfolio. The Student Fund’s investment philosophy is that of value-oriented fundamental analysis. The sector analysts generate quality research to aid investment decisions. The Senior Analysts mentor the Junior Analysts in analysing sectors and evaluating investment options. The stock analysis meetings stimulate debate and a culture of forming opinions and questioning assumptions which leave the team richer in experience. The performance in the finance sector in the Summer Placements, 2018, has been exceptionally good with many regular recruiters opening up multiple roles. Many offers were made by Kotak Wealth Management, Mondelez Corp Fin, Avendus capital, Goldman Sachs, JPMC Markets. In continuation with the positive growth of offers from the Financial space that has been observed during the Summer Placements, XLRI has seen numerous full-time offers made by reputed firms in the financial sector. Students picked up PPOs from Investment banking roles offered by JPMC, Goldman Sachs and Avendus Capital. Recruiters from the BFSI space also include Citibank, Development Bank of Singapore, ICICI Bank, Yes Bank among others. ICICI Bank was the largest recruiter in this space. Students were also offered the wealth management role by Avendus Capital and Kotak Mahindra Bank. Other companies also visited campus offering PE, VC and IB roles. Evidently, XLRI is fast establishing itself as a leading B-School for finance specialization by enriching the knowledge of finance amongst the students, strengthening their involvement in the discipline, and increasing collaboration with the academia and industry. Editor’s Note – Meet Top Finance Professionals From Goldman Sachs, Credit Suisse, Bank of America, Kotak Mahindra Bank, and more on 2nd February 2019 at Fun Republic Social, Andheri, Mumbai. Register here. What Can Future Executives Learn From Adam Gilchrist?